When it comes to storage space in and around the home, it often seems that there is never enough. Smaller homes and older homes are particularly prone to the storage challenge. Finding creative ways to add functional storage and make more space in a small room is often a necessity for these homeowners. Remodeling attics, basements, garages, or building a home addition to gain square footage are all solutions that will definitely work. However, remodeling is an expensive option that not everyone can or wants to afford. Luckily, there are plenty of ways to simply give the illusion of increased space in a small room that can make your home feel bigger — allowing it to work better for you and your family. Staying organized is half the battle to successful living in a small home. It is so easy for stuff to pile up in corners. Purging items you don't need or use is essential. Keeping the rest under control can be achieved by maximizing the storage potential in and around the home. Shelving space uses the empty area between walls. In most cases, the interior walls of your home are uninsulated and hollow, meaning there is unused space available between the wall studs. This empty space has long been pressed into service by bathroom designers as a good place to recess the medicine cabinet. The interior walls in your home can handle more than just a medicine cabinet, however. You can add recessed shelving and niches built to fit between studs. Just be careful you are only cutting into a non-supporting wall. Removing or adding support beams and columns is best left to professionals. There is often open space along the wall and just under the ceiling in most homes. Rather than leaving it unused or as an empty soffit, maximize this space for storage by using cabinets that go all the way to the ceiling. A second row of cabinets extends the storage to the ceiling. After ensuring that your cabinets go all the way to the ceiling, go one step further and install upper cabinetry over your seating and sleeping areas. You don't need as much overhead space as you probably have in these areas, as you are always sitting or laying down in these spaces. You may as well put the empty space over your head to good use with some functional storage. Overhead cabinets that extend to the ceiling add storage over this sofa. Entryway coat closet at the top of stairs. 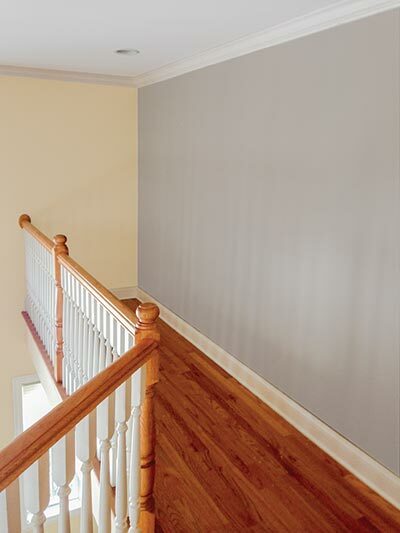 Older homes may lack large closets, but they often have grand staircases with large landings. International Residential Code specifies the minimum space for staircase landings at only 36 inches from the back wall to the first step. 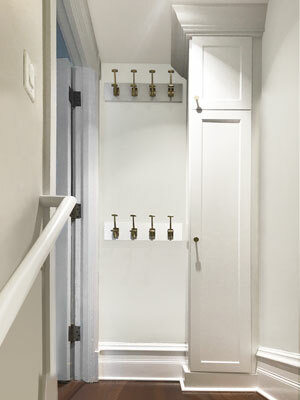 Put the extra space at the top of the stairs to work with a small wardrobe closet and/or hooks. 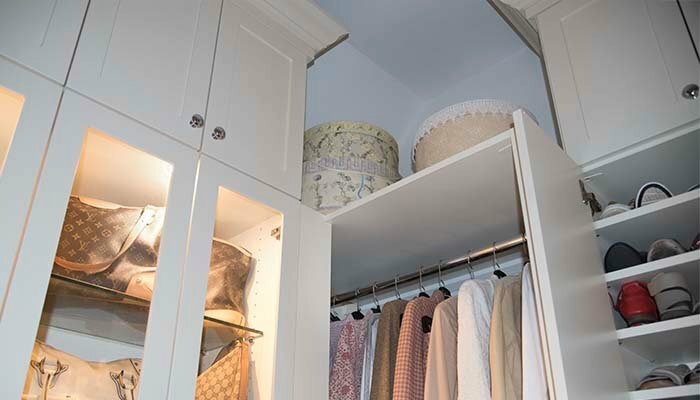 Even a tiny, shallow depth closet like the one pictured here can help ease storage constraints in a small home. 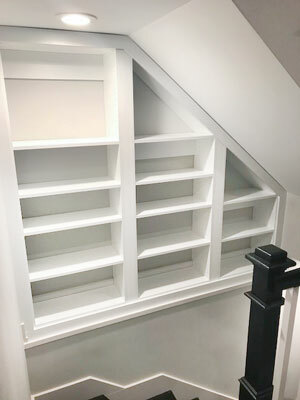 This third-floor walk-up lacked a coat closet or mudroom, and there was no practical place to build one inside the unit. However, there was plenty of space outside the back door at the top of a private staircase. A box under the bed has long been a place to stick extra storage. The problem with this strategy is that it is often difficult to find and retrieve the stored items when you need them. A better solution is a bed with drawers built into the base. A well-designed bed with drawers and storage underneath can even eliminate the need for other furniture to store clothing. This frees up space in a small bedroom. 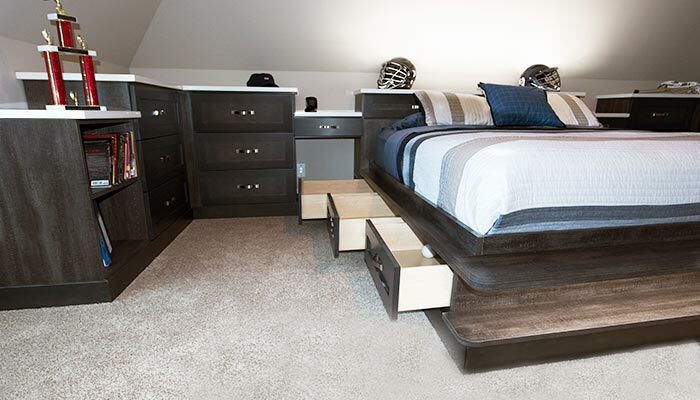 Platform bed with built in storage drawers under the mattress. It's simple math — two closet rods can hold twice as many clothes as one. 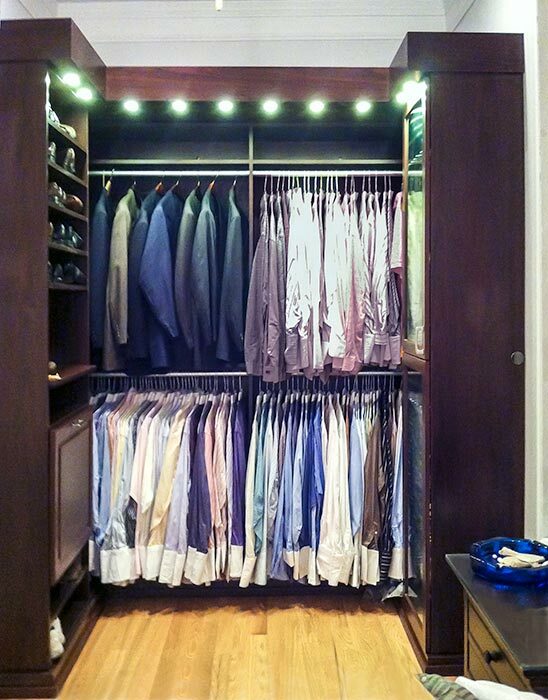 The addition of closet organizers to your traditional closet spaces can quickly double your storage capacity. If you live in a small house and are tight on storage space, this is one of the first things you should do to increase storage space in the home. L-shaped reach in closet with closet organizers that doubled its previous storage capacity. The 360 Organizer® Shoe Spinner by Closet Works. Corners host a lot of wasted space in many cabinets and closets. It can be difficult to find and retrieve items stored in the back when you want them. A rotating storage solution can eliminate this problem and add a lot more storage potential to the space. The entire corner becomes accessible and functional for storage when rotating closet and cabinet organizers are used. 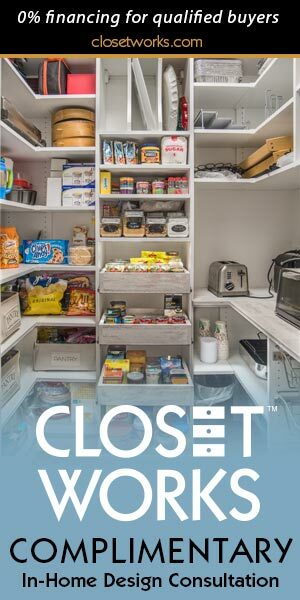 The 360 Organizer® is a fully rotating closet and pantry solution. Some models even come with their own cabinet. These functional storage solutions don't require a lot of room but add so much storage that they can even replace an entire closet, freeing up the existing closet for other uses. 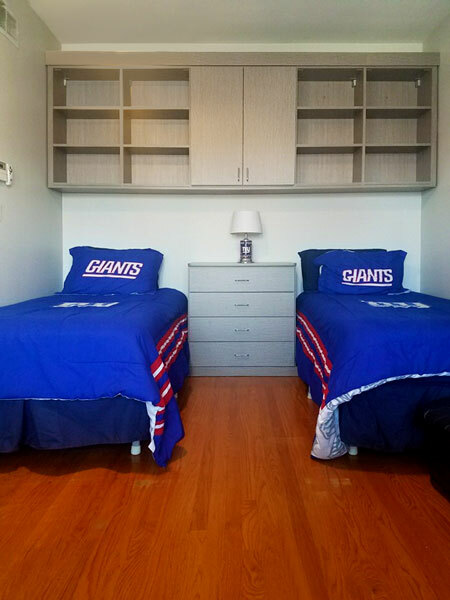 An office, living room, rec room or den can also serve as a bedroom when Murphy beds are installed. 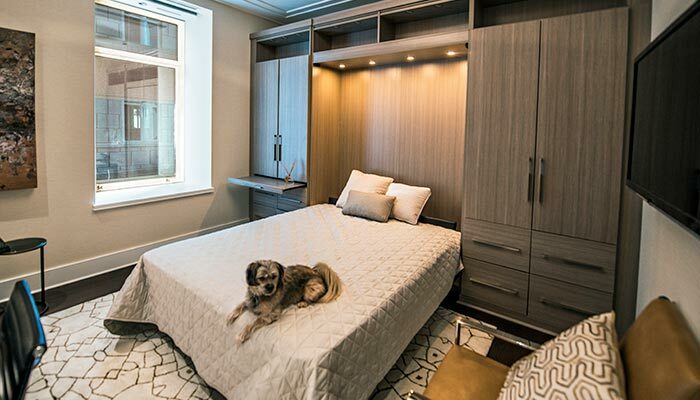 Even better is the custom cabinetry that can be ordered to surround a Murphy bed. 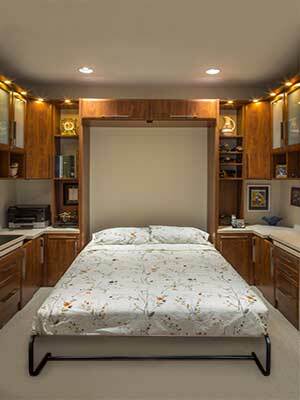 A Murphy bed wall unit adds floor to ceiling storage surrounding the bed. There is a lot of floor space in this room when the Murphy bed is closed, making the space appear larger. 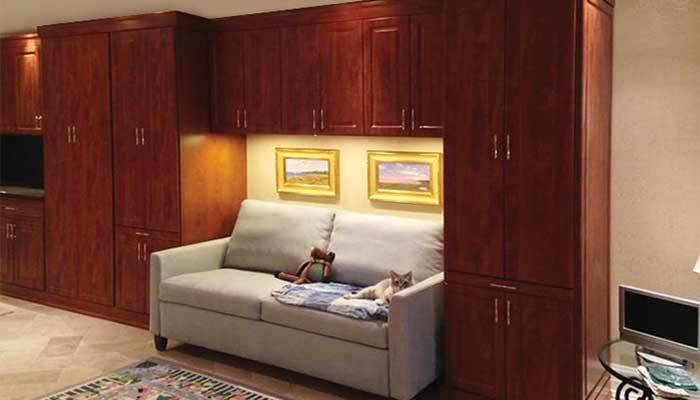 A Murphy bed can improve functionality by allowing rooms to serve dual purposes. Wall track doesn't have to be for use in garages and over tool benches only. Residential wall track systems can be made into an easy and practical backsplash for the kitchens. 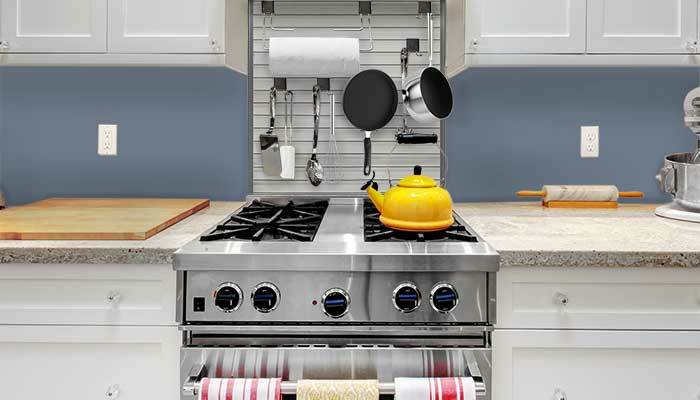 Whether you use it to cover the whole kitchen or only a small section over the stove, wall track can be a convenient place to hang cooking utensils and small pots and pans, adding a lot of storage to small kitchens. Aluminum Omni Track wall track used as a backsplash behind stove also holds cooking utensils. Although mirrors cannot change the physical dimensions of a room, they can make it feel larger than it is. Get rid of that claustrophobic feeling and use large mirrors to increase the visual sense of space in your small room while brightening the space with more light. Use white or light paint and finishes with the largest mirror possible to reflect the maximum amount of light. 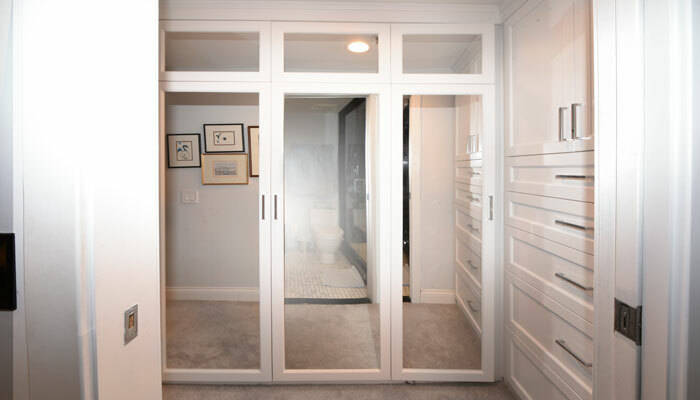 Mirrored cabinet doors on the closet make space in this hallway appear larger and brighter. Try it. We think you'll like it. If enough of these ideas are implemented correctly, you may never lack for storage again. Built in bookcases used as a headboard can add a lot of storage to a small bedroom without taking up any floor space at all. 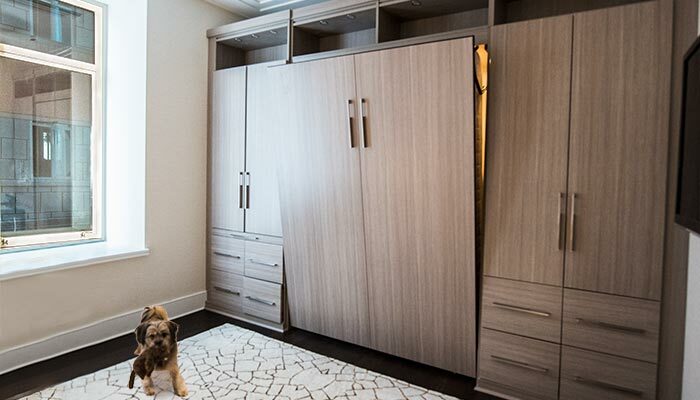 Make space in your home and increase the visual perception of how much square footage you have by removing a closet wall. Instead, go with attractive cabinet quality closet organizers that lend a polished look to the space and prevent it from looking messy. 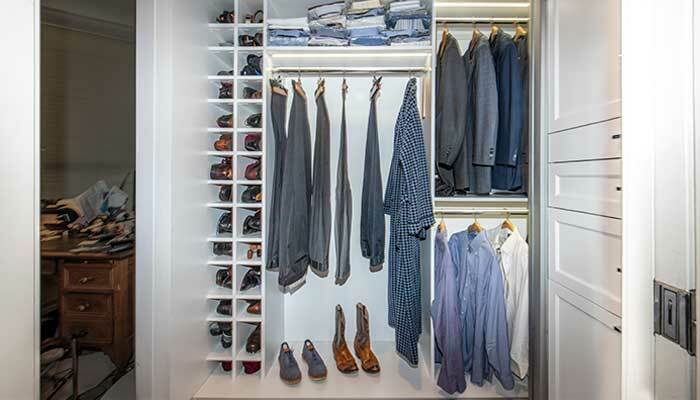 You can increase storage space for your home with a wardrobe closet. 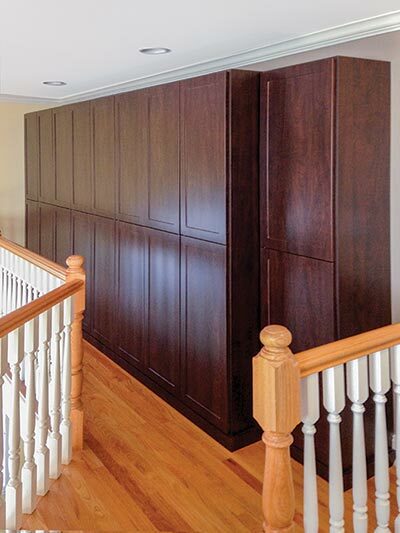 A very long wardrobe was installed at the top of this oversize staircase landing. It adds a lot of storage to this funny landing space that was otherwise wasted and neglected. This space, no larger than the average walk in closet, does triple duty a home office, guest bedroom, and TV room/den. The office even accommodates two workers at once. 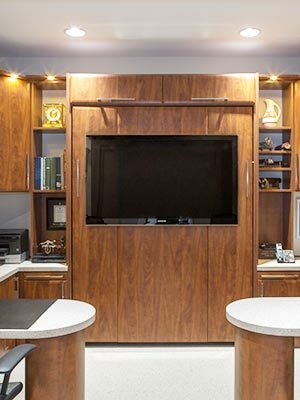 It was all accomplished by the use of a Murphy bed and custom slide away desks. The television is mounted to the front of the wall bed panel. Convenient during the day, it disappears when the bed is opened for sleeping. If your space is tiny, you can't waste even one square inch! This closet shelving extends all the way to the ceiling. 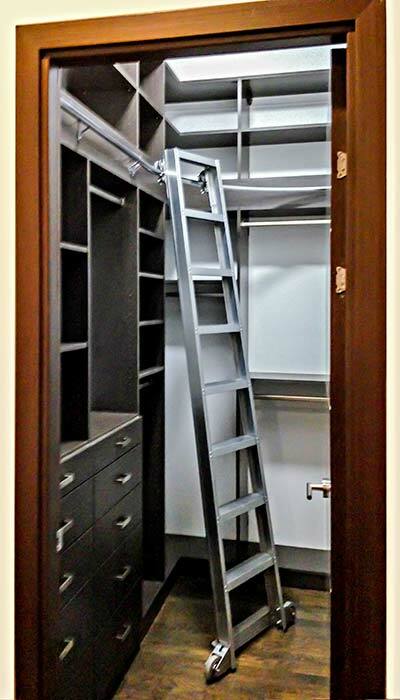 A rolling closet ladder was installed for convenient access to items on upper shelves. 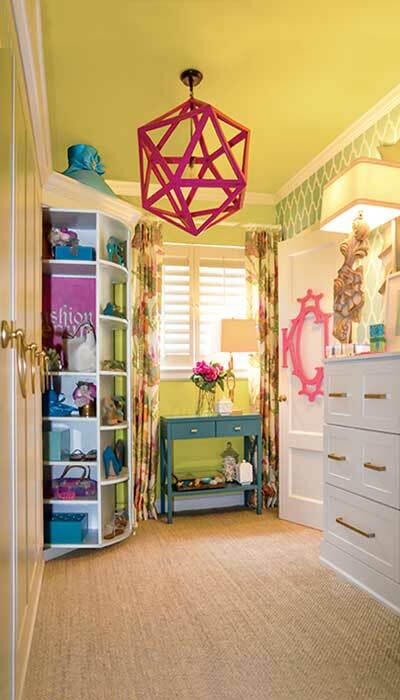 A rotating shoe rack was installed in this closet dressing room to max out storage space in the corner of the room.